People coming together to conserve a globally rare ecoregion right where we live. 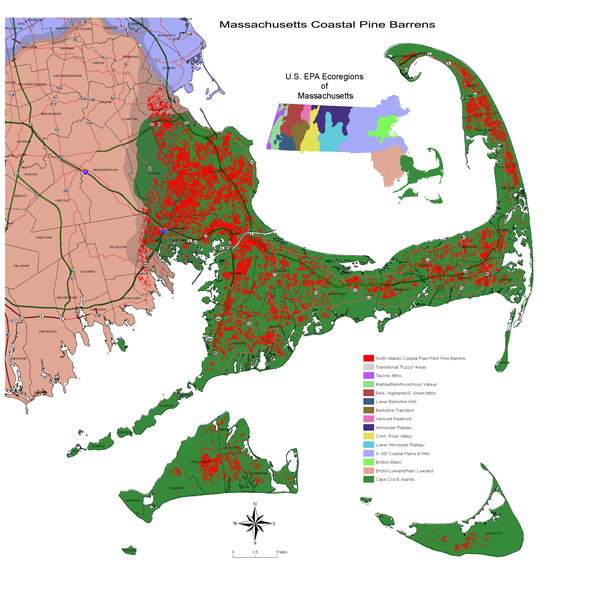 Call to action: Join the movement to create unity and connectivity across towns, government agencies, and non–profit organizations for the protection and preservation of the locally special and biologically significant Massachusetts Coastal Pine Barrens ecoregion. What is a Regional Conservation Partnership (RCP)? A RCP is an informal network of people representing private and public organizations and agencies that work together to develop and implement a shared, long-term conservation vision across town boundaries. The pace of development and rise of ecosystem-based science indicate that effective land protection must focus beyond opportunistic acquisition of isolated parcels to larger connected habitat systems. Success depends on strategic collaborative efforts across organizations, across sectors, across disciplines, through networks. Today in New England there are 40 RCPs, covering more than 60 percent of our regional landscape. View RCP Map. Why do we need a RCP for the Coastal Pine Barrens? Coastal Pine Barrens are not barren. Our eco-region is filled with coastal plain and kettle hole ponds, frost bottoms, vernal pools, fire–dependent pitch pine- scrub oak– forests, grasslands, and other unique habitats supporting over 180 state–listed species of rare plants and animals. This region of fast–draining glacial out-wash soils includes and links all of Cape Cod and the Islands plus the upper Cape towns of Bourne, Wareham, Marion, Plymouth, Carver, and Kingston, encompassing numerous watersheds, and overlying the Cape Cod, Martha's Vineyard, Nantucket and Plymouth–Carver sole–source aquifers. Many government and non–government entities share visions, concerns, and stewardship responsibilities for these rich natural resources that we are fortunate to enjoy. But multiple and urgent threats combine and accelerate to necessitate greater efficiency of effort and cooperative participation. A Regional Conservation Partnership (RCP) can provide the synergy and supporting structure to foster collaborations for enhanced accomplishment of diverse yet mutually compatible missions. Representatives of member groups or individuals that agree to participate will coordinate efforts, enhance information exchange, and ensure better planning, oversight and management of the public's shared resources.